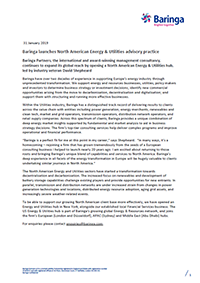 Baringa have over two decades of experience in supporting Europe’s energy industry through unprecedented transformation. We support energy and resources businesses, utilities, policy makers and investors to determine business strategy or investment decisions; identify new commercial opportunities arising from the move to decarbonisation, decentralisation and digitalisation; and support them with structuring and running more effective businesses. Within the Utilities industry, Baringa has a distinguished track record of delivering results to clients across the value chain with entities including power generation, energy merchants, renewables and clean tech, market and grid operators, transmission operators, distribution network operators, and retail supply companies. Across this spectrum of clients, Baringa provides a unique combination of deep energy market insights supported by fundamental and market analysis to aid in business strategy decisions. The firm’s top-tier consulting services help deliver complex programs and improve operational and financial performance. The North American Energy and Utilities sectors have started a transformation towards decentralisation and decarbonisation. The increased focus on renewables and development of battery storage capabilities challenge existing players and provide opportunities for new entrants. In parallel, transmission and distribution networks are under increased strain from changes in power generation technologies and locations, distributed energy resource adoption, aging grid assets, and increasingly severe weather-related events. To be able to support our growing North American client base more effectively, we have opened an Energy and Utilities hub in New York, alongside our established local Financial Services business. The US Energy & Utilities hub is part of Baringa’s growing global Energy & Resources network, and joins the firm’s European (London and Düsseldorf), APAC (Sydney) and Middle East (Abu Dhabi) hubs.